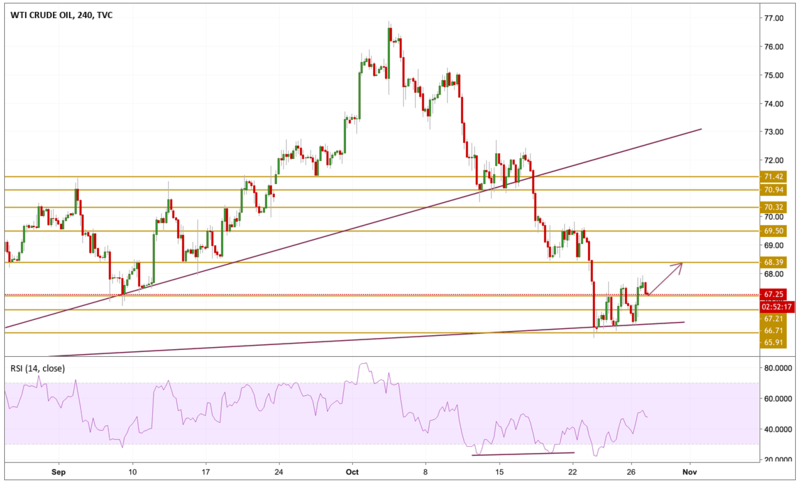 Crude oil prices are seeing some strength in the week's early trading, with WTI trading above the $67 level as energy markets attempt to continue a bullish recovery after several days of weakness caused by the global selloff in equity markets. Overall market sentiment remains cautious as traders focus on the US sanctions on Iran. However, the relief for the US oil is likely to be seen from ever-rising US production, with the EIA's output count currently adding 11 million barrels per day. Prices have been steadily declining for nearly four weeks, peaking at $77.00 in early October and tumbling steadily ever since. Crude oil is currently trying to break to the upside, settling above the $67 level. The momentum on the RSI is printing higher highs and higher lows just as the price, pointing towards a build up in the momentum so the next level we will be watching is the $68.4 resistance level.